Probably not a thing you haven't seen before as these vegan crumble cake bars are super popular all over pinterest. I've been wanting to give these a try for a very long time and a few weeks ago I finally got my hands on some fresh strawberries and decided to give it a go. It did take around three attempts to perfect these babies (and I enjoyed each and every one of those attempts as a taste tester 😛 ) but we have finally hit gold. sweet, and crumbly, and chewy, and just overall yumm. perfect for meal prepping - make a batch on Sunday and you'll have crumble cake bars for a few days to come. the most perfect dessert to have after a dinner meal, maybe with some ice cream on top? so good especially fresh and warm out of the oven. a delicious road trip snack to have along for the ride. Yes, guilty. I took some with me on our road trip last weekend and it was so gooood being able to eat these in that random hotel room in Georgia. 😛 felt like home. You can get super creative with your bars, do not limit yourself to just strawberries. I've already made blueberry crumble cake bars and even cherry crumble cake bars... we're eating crumble cake bars for breakfast, lunch and dinner around here. They're that good. 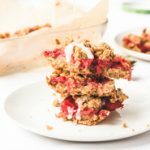 These are very basic strawberry vegan crumble bars. We've got rolled oats (not oat flour! ), almond flour and date paste to bring it all together into a delicious sticky mess. Add to that a layer of sweet strawberry filling, which we will be making ourselves with some fresh strawberries, agave, and vanilla flavoring (yummm). And top it off with a sprinkle of some of that left over oat-almond-date-paste crumble! 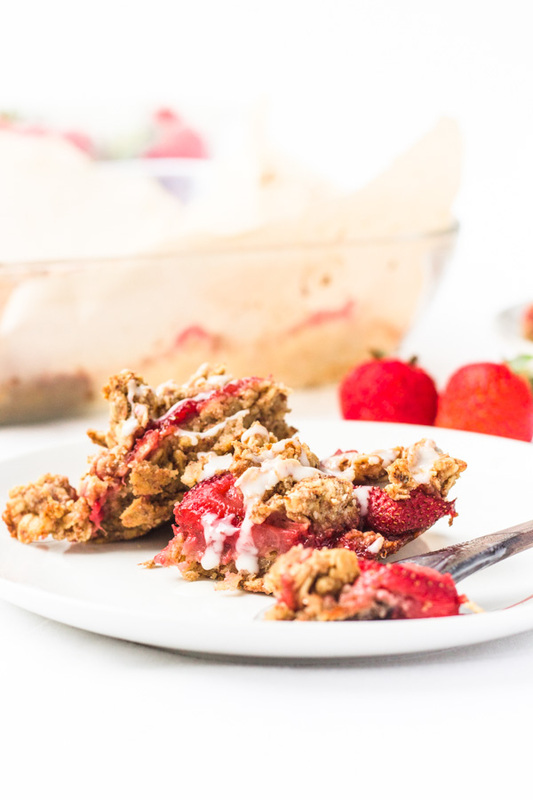 Pop it in the oven for 40 minutes give or take and wah-la - your strawberry crumble cake bar dreams come true. Refined sugar free, refined oil free, and gluten free (if using certified gluten free oats). Another guilt-free dessert that is loaded with protein from the oats and almond flour! Enjoy! Want to see more mouth-watering vegan desserts? This vegan mango snack cake is what dreams are made of, or maybe you prefer smoothies like this cherry breakfast smoothie bowl topped with chocolate sauce!